60% cotton/40% polyester fleece. White is sewn with 100% cotton thread for easy garment dyeing. 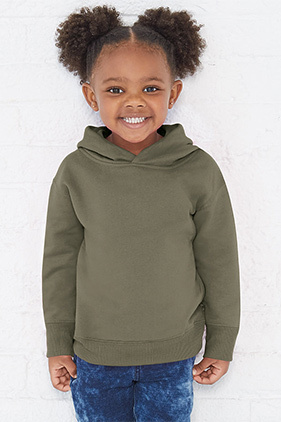 7.5 ounce toddler unisex hooded pullover. Jersey-lined double needle hem hood for a clean, finished look. Topstitch hood and neck keeps facing in place. Side seam pockets give this garment pockets and let printers use the same size design and screens for both youth and toddler hoodies. Coverstitch shoulders and armholes. Coverstitch ribbed cuffs and bottom band. Side seam construction for exceptional quality and durability. EasyTear™ label for additional comfort and ability to brand as your own. CPSIA compliant tracking label in side seam.